We know you love chiropractic. Share the benefits of chiropractic by referring a friend who may need a helping hand with their health. Simply enter your friend's details in the form above and we will contact them to confirm their new patient consultation. Each new patient is eligible for our standard New Patient Consultation so that they can decide if chiropractic is right for them. Together, we can help the local community by offering a more natural approach to health. 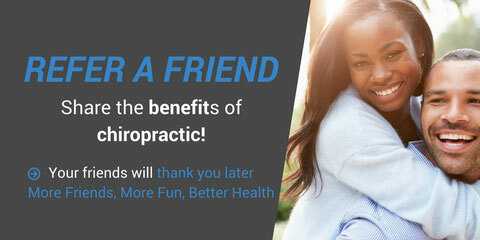 We look forward to sharing the many benefits of chiropractic with your friends.